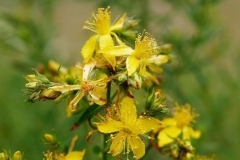 St. John’s Wort oil is an ointment obtained by maceration in extra virgin olive oil of the inflorescences of Hypericum perforatum, officinal plant known as St. John’s Wort with anti-depressant, antibacterial and anti-inflammatory properties. Such properties are due to the many active ingredients produced by the plant’s petal oil glands such as hypericin, pseudo-peripicin and iso-peripicin. During the extraction period, the lipo-soluble functional substances of the Hypericum perforatum pass into solution in olive oil: an oily extract is thus obtained from the typical red color, which is used for external use for its eudermic properties, particularly in case of dry skin and reddened by external agents such as sun, wind and low temperatures. 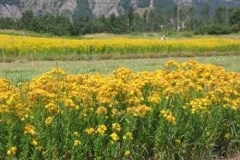 Hypericum oil is able to stimulate cellular reproduction and tissue regeneration, and this is made possible by the presence of hypericin contained therein.Application is contraindicated before exposure to direct sunlight as a photosensitive product. 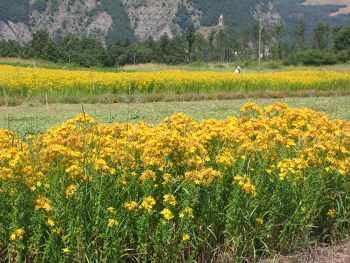 Due to its therapeutic properties, hypericum oil is widely used in the treatment of shots and burns due to its healing, disinfecting and soothing action. In these cases, it is sufficient to apply the oil directly to the skin. It also performs effective action in cases of solar erythema. Thanks to its emollient action, hypericum oil is an excellent natural remedy for who suffer with dry skin and for those with psoriasis problems. hypericum oil is a cure for cracking, redness and cold cuts. Among anti-aging natural products, it is one of the most powerful in the industry: it is probably the most effective anti-wrinkle and anti-aging product that exists in nature. It will be enough to apply it every night on face and neck to see the first results after only 10 days of application. It also performs effective action in the case of decubitus wounds, stretch marks, scars and acne scars. The topical application (two to three times daily) improves wound healing.